In October 2015 we are featuring the following four very different gourmet teas: A delicate Yin Zhen white tea; the rare Rohini Green tea and complex Smoked Oolong, both from India; and our first dark tea – Tuo-cha, a type of pu-erh. Mixed: Yin Zhen Silver Needle and Tuo-cha Pu-erh. Welcome to another month of Curious Tea subscriptions! 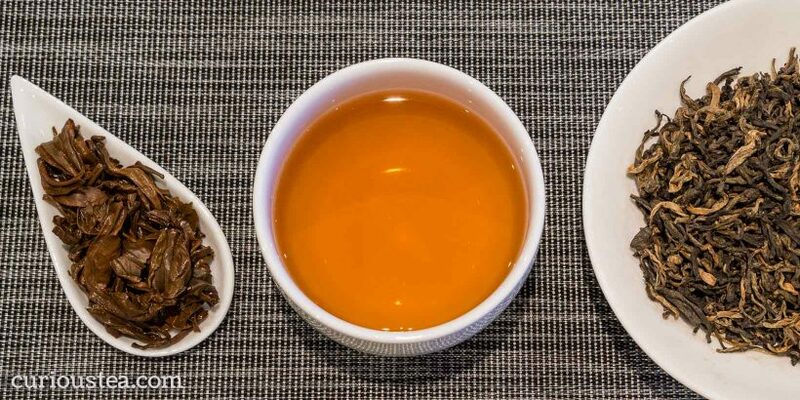 This month we have some special and exquisite teas: our first pu-erh in the shape of small pressed domes, a very fine and highly prized white tea from China, an unusual smoked oolong from Assam and a rare green tea from Darjeeling. We had a great time selecting these fantastic teas to share with you. We hope you will enjoy our selection, and to help you along with the tasting, here is some further information on all teas featured in our October Curious Tea boxes. Yin Zhen Silver Needle is a very high grade white tea from Fujian Province in China. To those who are familiar with White Peony tea, Silver Needle tea is the plucking that precedes that of the White Peony and is considered to be the higher grade crop. It is one of the most prized varieties of white tea as only the top choicest buds are used to produce this exquisite tea. The delicate and careful selection of only the best and youngest tea leaves results in a tea that is very light and subtle, whilst having a refined and complex flavour profile. 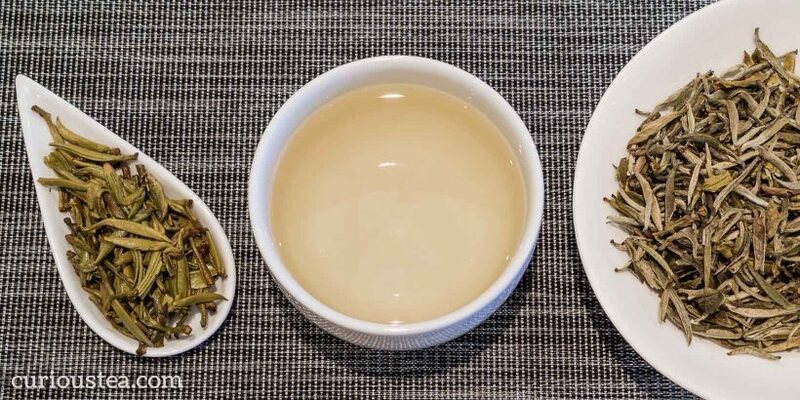 A very good white tea such as this features plenty of buds with silver hairs, the downy look of which reflects the quality of the tea and gives it its name – Chinese Yin Zhen literally translates as Silver Needle. It is also sometimes known as Bai Hao Yin Zhen (White Hair Silver Needle) to reflect the presence of downy silver ‘hairs’ on the needle-like leaves. The presence of these silver hairs is a good indication of the quality of the tea, both in terms of growing and processing as well as further handling of this delicate tea. Yin Zhen is a very popular tea and is included amongst China’s famous teas. A proper Yin Zhen is a white tea and as such undergoes very minimal oxidation process. The production process begins in March and April when the tender tea leaf buds are carefully hand plucked before opening. After plucking, as is common with all white teas, the buds are left out in the sun to wilt. After wilting the leaves are lightly baked dry at a very low temperature to stop the enzyme oxidation process at the required minimal level. Unlike green tea, which undergoes a more rigorous frying process, the processing of white tea stops here hence it can be said that white is the least processed type of tea. Our Yin Zhen was selected by us for our October Light and Mixed Curious Tea boxes. The delicate silver leaves have plenty of white and silver down on them. When brewed the leaves unfurl producing a very light and fragrant liquor. This tea is very delicate and gentle in taste, the flavour is a little sweet and nutty with charming perfumed peachy notes to it. This tea is truly special and time has to be taken to appreciate its subtle beauty. This tea is best brewed at 80°C for 3-5 minutes according to your taste. This tea should definitely be brewed multiple times, increasing water temperature and steeping time with each next brew if desired. Also make sure to use very good quality filtered or spring water for this tea as low quality tap water will impair the delicate taste of this special tea. This is a rather rare green Darjeeling from the Rohini Tea Estate. Rohini Tea Estate is located along the route that connects the towns of Siliguri and Kurseong. Surrounded by beautiful natural environment this estate produces tea from relatively young trees. The estate has had a chequered past, not actually producing any tea for a long period of time. Recently it has been replanted with young tea trees, which sometimes has lead it to be called the youngest tea estate in Darjeeling. It is now going from strength to strength and is producing more and more interesting and quality teas. This green tea is a great example of what these new tea trees are capable of. Of course Darjeeling is mostly known for the light floral black teas that are so popular around the world for their complex and appealing characters. However there is also movement towards producing more curious and unusual teas that are not as typical of Darjeeling. The growing and production processes may be similar to other teas produced in other parts of the world but the unique terroir of Darjeeling stamps a distinctive mark on these interesting teas. We selected this Darjeeling Rohini Green for our October Light subscription. The fine green and silver leaves of this tea have a wiry appearance. The liquor produced is pleasantly fragrant and not too grassy unlike some other Darjeeling greens. There is still some grass present in the flavour of this tea and this is combined with a character that is slightly nutty, floral and a little sweet. This tea is very well balanced if brewed with care – soft while being quite full in flavour at the same time. Interestingly, there is a (somewhat unusual for a green tea) chalky note, which confidently points to the Darjeeling origin of this unusual tea and draws parallels with other teas to comes out of this distinctive terroir. This tea is best brewed at 80°C for 2-3 minutes and can be brewed multiple times. When experimenting with repeated steepings, you can gradually increase the water temperate and steep time to extract fuller flavour. Pu-erh Tuo-cha is a special tea that comes out of China. 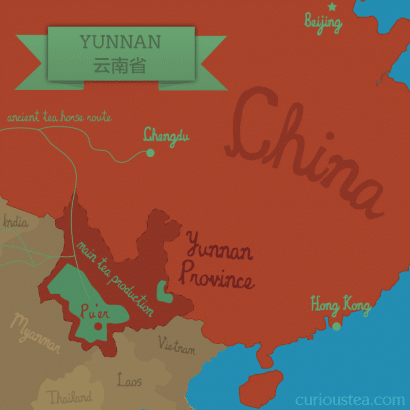 Many varieties of pu-erh are produced and it is a particular speciality of Yunnan Province. Pu-erh tea is highly prized and certain varieties of aged pu-erh can fetch extremely high prices. 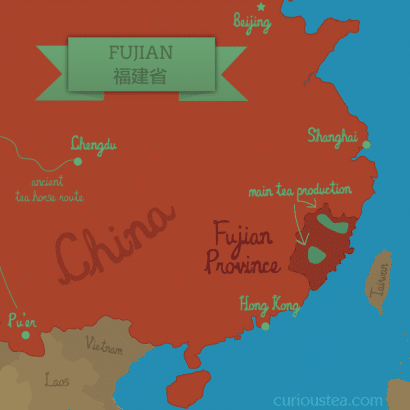 Pu-erh gets its name from Pu’er, which was an important place for tea trading in ancient China. To clear up a commonly occurring confusion, pu-erh (sometimes written pu’er) is a type of tea that in China is called ‘dark’ or ‘black tea’ – Hei Cha (黑茶). The English and Western term for black tea actually corresponds to ‘red tea’ or Hong Cha (红茶) in China. So it’s an important distinction to bear in mind when talking about all types of dark and black (red) teas from China! Following the Western tradition when we talk about black tea on our website, we always refer to black teas from various parts of the world including teas that are labelled ‘red teas’ in China. Post fermented teas such as pu-erh are referred to either by their specific type or simply as ‘dark teas’ to save any confusion. Pu-erh tea undergoes an unusual production process, during which the tea leaves are dried and rolled after which they undergo secondary microbial fermentation and oxidation. This unique processing means that it is incorrect to label pu-erh a type of black tea and it fits within the separate dark teas category. The tea is most commonly pressed into various shapes (domes, disks, bricks, etc) and the gradual fermentation and maturation process continues further during storage. The shaped pu-erh tea can be stored in order to mature the tea and let it develop more flavour, very much like maturing a good bottle of wine. While Pu-erh is a special type of tea, the term Tuo-cha refers to the shape of this tea – which is in a bowl or nest shape. In terms of size, a tuo-cha can range from 3g up to 3kg. The origin of the term Tuo-cha is unclear but most likely refers to either the shape of this tea or to the traditional shipping route for this tea along the Tuo River. This particular Pu-erh Tuo-cha comes in very neat individually wrapped small dome-shaped cakes that are around 4 to 5 grams in weight. This makes them ideal for brewing a small teapot – just use one cake per 500ml. If you would like to make less tea in one go, simply split one of the cakes in half. You should remove the white paper wrapper before you brew this tea! This Pu-erh Tuo-cha is the first pu-erh to feature in Curious Tea boxes and we selected it for our October Dark and Mixed selection box. The cakes are tightly pressed together black leaves with golden tips. The brewed liquor has a pleasant but a slightly unusual fragrance, which has definite notes of smoke and peat. The flavour is very well balanced and not too earthy, which can be a common predominant taste amongst dark teas. On the tongue there is a neat balance of fruit, smoke, earth, with particular notes of peat and prune. This is a very satisfying drink that is very well balanced and enjoyable. This is an extremely rare oolong to come from Assam in India. There are hardly any estates that produce this type of tea in Assam. We only know of two: Mothola and Doomni. The rarity of this type of tea from the area and the very small production amounts make Assam oolongs a very rare find indeed. But after some searching and establishing that this is one amazing tea, we managed to source this unusual Smoked Oolong from Mothola Tea Estate. 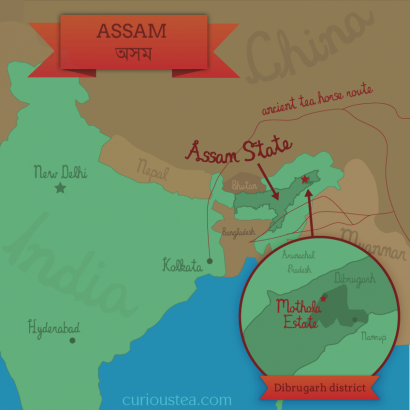 Mothola Tea Estate is located on the north bank of the Brahamaputra River in eastern Assam. In the past the tea estate lost of a lot of land to the river but recently land has been reclaimed and new tea plants were planted. 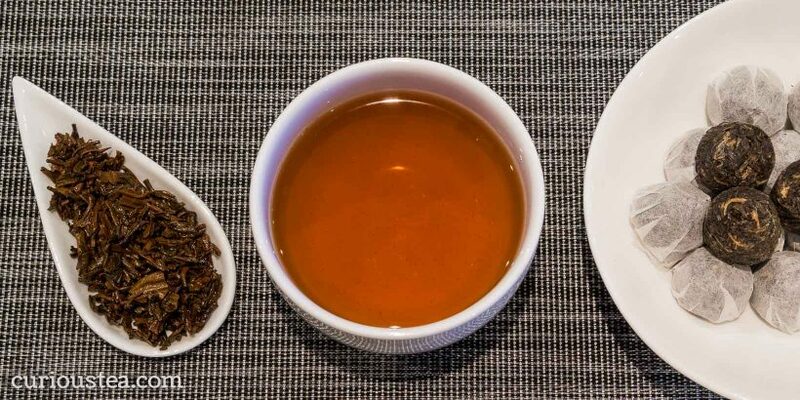 Mothola Tea Estate produces a wide variety of teas, but they also specialise in producing more unusual teas in very small amounts, like this Smoked Oolong and their Assam White tea. For anyone who is cautious about trying a smoked tea (熏茶), please do not hesitate to try this one! The level of smoke in this tea is much less than in most Lapsang Souchongs (the archetypal smoked tea) giving a flavour that is more balanced and not as strong. This is largely due most smoky teas being smoked over pine or similar strong woods. This oolong however is smoked over oak instead, enriching the tea with a gentler flavour. It is still reminiscent of a camp fire and has that smoky taste but is nowhere as pungent. We couldn’t pass by this opportunity to feature such a rare tea, so we selected this Assam Smoked Oolong from Mothola Tea Estate for our October Dark boxes. The dried leaves of this second flush oolong are rather large and have a very beautiful appearance with plenty of gold colour. The liquor has a lovely amber red colour to it and a distinctive lightly smoked fragrance. This tea packs a lot of flavour and has a sweet and balanced profile of smoke, tobacco and fruits. In particular there are apricot notes that are quite delightful and balance the smoke quite well. At the same time, this tea has a most intriguing flavour resemblance, which is whisky. The various tastings of this tea led us time and again to draw similarities between this Assam Smoked Oolong and a good single malt Scotch whisky. Definitely one of the most intriguing teas taste-wise out there! This tea is best brewed at 90°C for 2-3 minutes and can be brewed multiple times. Best taken without milk or sugar. We really hope that you enjoyed the tea club selection for October and are looking forward to what we have in store for your November selection. Incidentally, if you are reading this but do not subscribe to our monthly tea selection and would like to receive our future selections, you can easily start receiving our tea subscription boxes in just a few clicks. We ship worldwide from the UK.